These roles are typical for such an business application and mostly tightly coupled to the corresponding business methods – e.g. createOrder(), approveOrder() and executeOrder(). This works well in a monolithic business application where you can control the security layers as also the business logic. But as more complex the business application becomes, also the enclosed security becomes more complicated. For modern application design, in addition, you often have to deal with external web services and business logic which need to be adapted easily to changing requirements. So this static security model leads into a hell of hard coded business rules or, what is worse, can no longer guarantee the security. Using a workflow engine in general offers manifold opportunities to solve such a situation in a model driven way. With the Human-centric workflow engine Imixs-Workflow, the mapping between a function and a business role is done by the workflow model. So the business functions will be decoupled from the business process and can be designed in a more flexible way. You can create the business model using the Eclipse based modelling Tool Imixs-BPMN. In our example above the ACL for the Task ‘Approve Order‘ grants a write access the Management department but only a read access to the Sales Department. The Finance Department is not yet allowed to access the task. Still we have no mapping between our ordering application and the ordering process. So now it’s time to bring the workflow into our business application. The Imixs-Workflow engine can either be embedded into the code or called via a rest service API. The following example shows how you can call the order-process using the embedded engine. The Imixs-JSF Sample application gives a excellent overview how to use this application as an template for custom projects. With the approach of the Imixs-Workflow engine you can decouple our business logic from hard coded security roles. The important part here is, that you do no longer need to assign a security role with methods into the code. Instead, you create a process instance managed by a workflow engine. 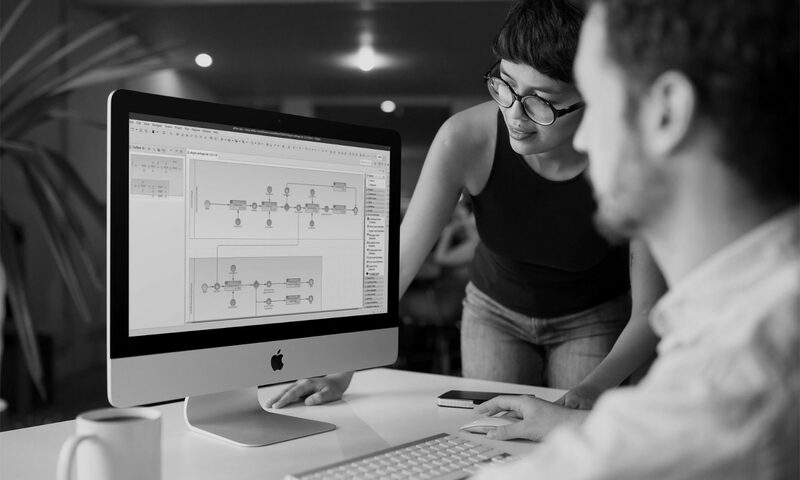 The security is modeled in a BPMN process model and can be adapted easily to new requirements without the need to change the business functions. Instead that we secure our business methods by hard coded functional roles, we now secure our business objects. This is a powerful concept which extends the behavior of a business application and can bear also complex business logic. Previous PostPrevious Imixs-Workflow 4.0 released!